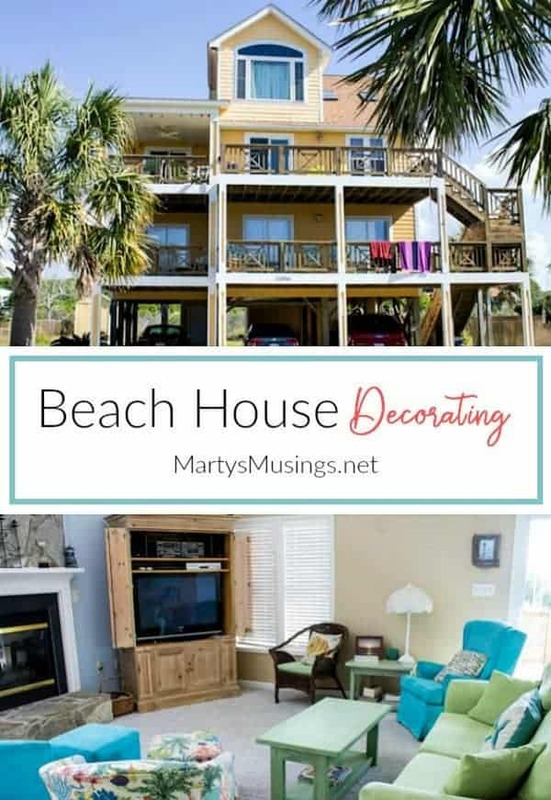 Full of detailed pictures and home decor, this post is filled with beach house decorating ideas that will have you dreaming of your own escape one day! Our family spent last week in Emerald Isle, NC enjoying some good food, family fun and as much sun as we could handle! I find the older I get the less enthralled I am with hours on the beach burning to a crisp. Since this was our second year at this specific house I took several pics so I could share some great beach house decorating with you guys. The house is quite interesting with unique details and style. 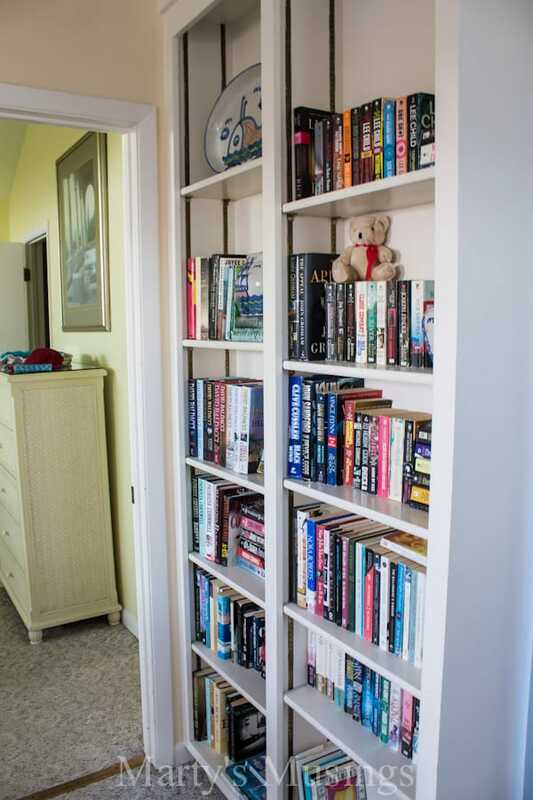 Sometimes when you rent you never know if the house will be clean, functioning or look s as good as the pictures. This house did not disappoint us. Key to taking pictures? Sending the kids and Tim off to the beach before they had time to make themselves at home! I didn’t photograph every room but am including my most favorite details. When I’m on vacation I refuse to be as obsessively overly neat, but we try to keep the major living areas manageable. If not, we’d be looking for sunscreen for hours. Know what I mean? The house has three levels, which is only a problem when you’re hauling all your groceries, suitcases and personal belongings. By the end of the week my calves had gotten a workout which made me thankful I live in a one level! 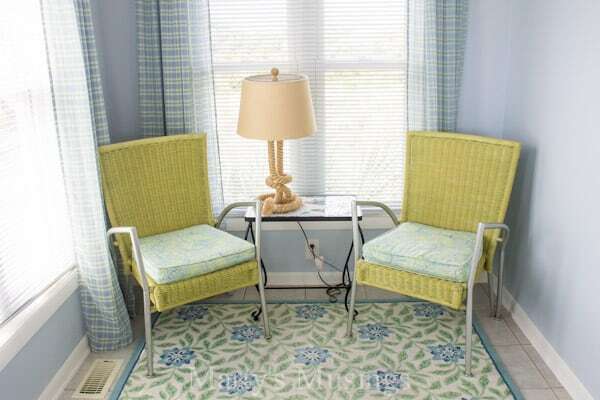 The style is very casual with a teal and lime green color scheme that is so refreshingly cheerful. 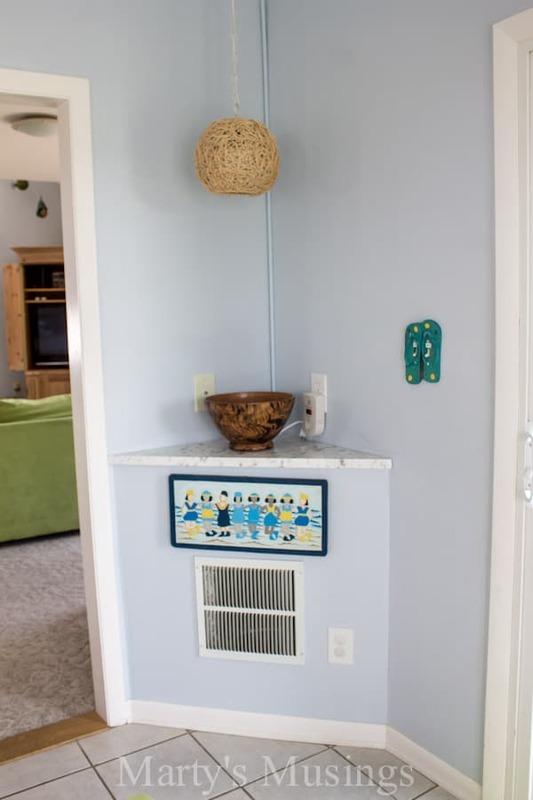 Almost the entire main level is painted a pale beachy blue and the owner has pulled in unique, original art work that is so fun. 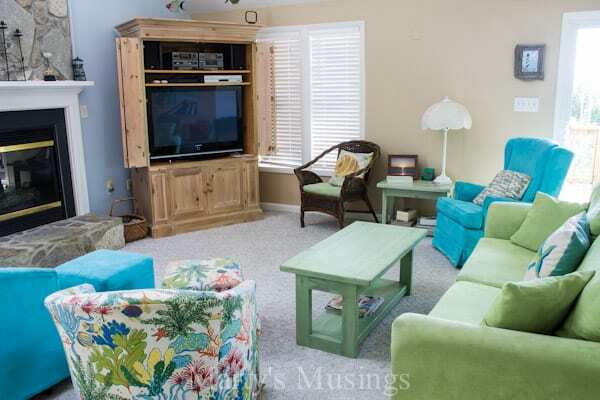 I love that the furniture is a mix of prints and solids, but it’s also comfortable and durable. 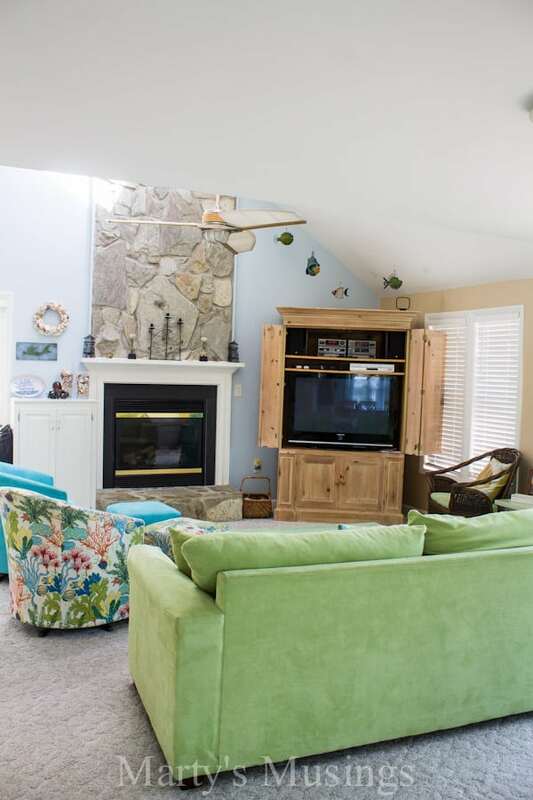 The stone fireplace is just gorgeous in the cathedral ceiling living room. 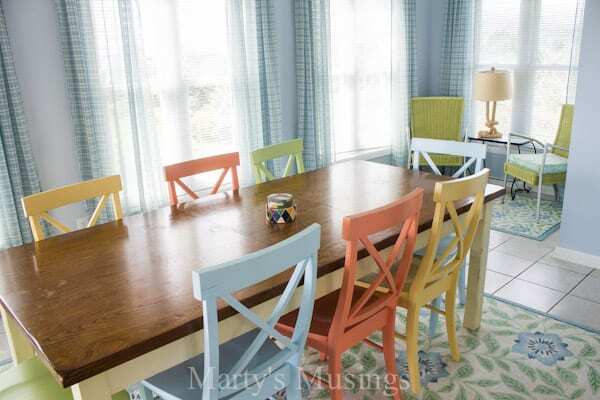 The dining room is one of my favorite areas with a fun mix of different colored chairs and great natural light. 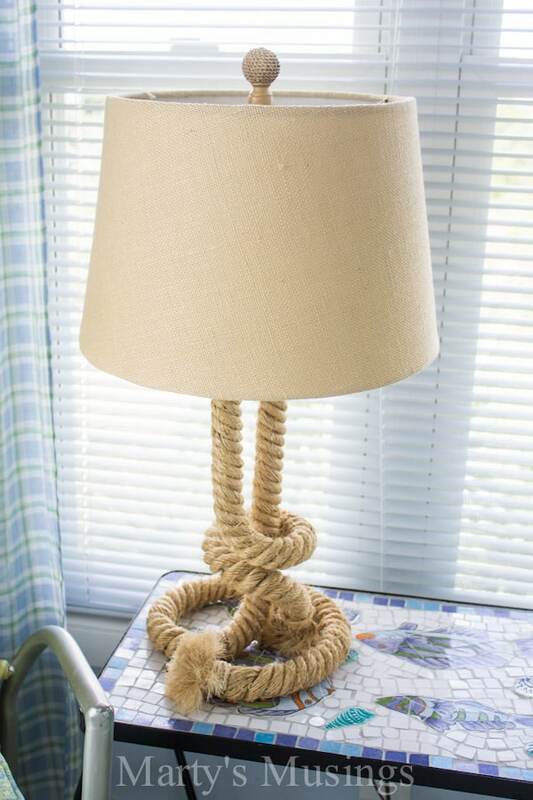 The rope lamp adds to the casual beach decor. 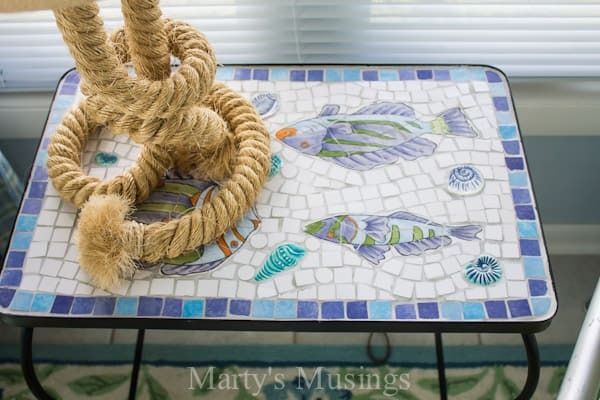 This wrought iron table with mosaic inset is just gorgeous. Here you can see one of the two levels of decks. Tim enjoyed his coffee out here in the mornings as I had my quiet time. Such a great piece of art work! Downstairs there is a large bedroom with queen bed which is where our daughter and son-in-law stayed when they came down midweek. Blurry picture (sorry!) 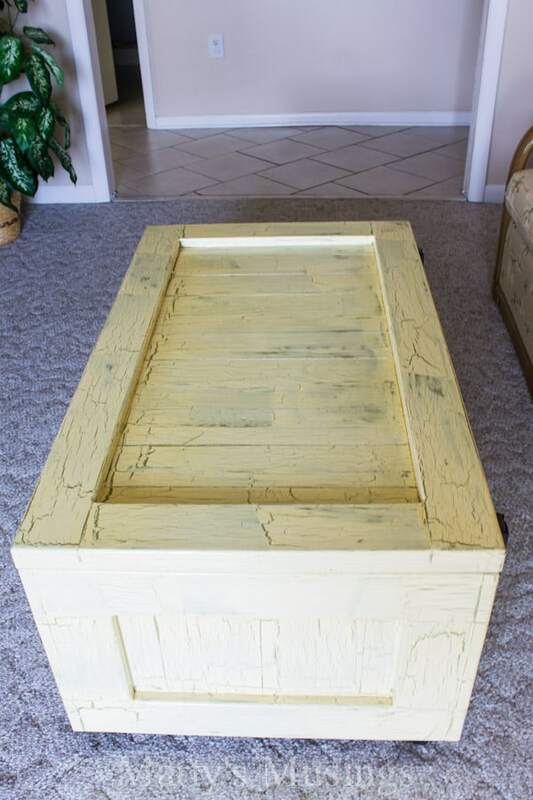 but I love this rustic table. 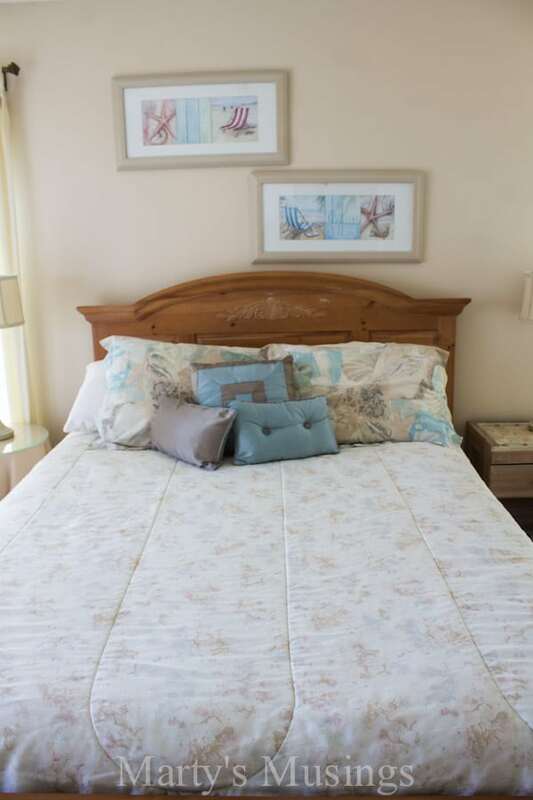 The second room downstairs contains a foldout queen bed which is where our son and daughter-in-law stayed when they also came down midweek. Love the finish on this piece. Framing out the window was this unique wallpaper. Not pictured is a third bedroom downstairs with a set of bunk beds and private bathroom (a total of two baths downstairs). 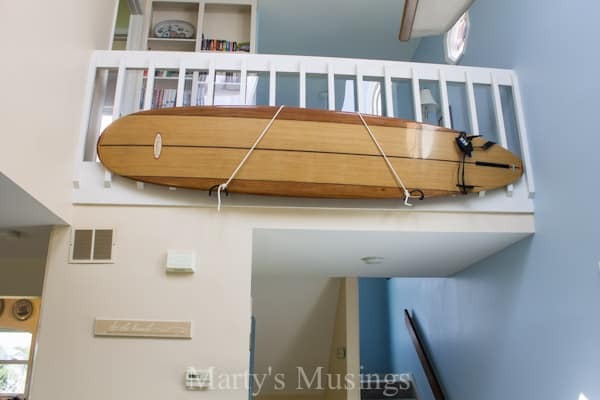 This surfboard makes a perfect accent piece under the third floor railing. 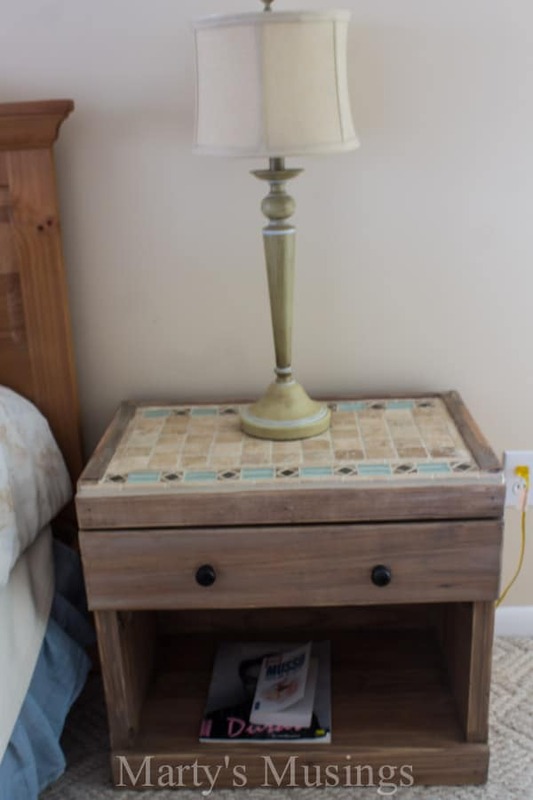 The master bedroom is located on the top floor and this little nook was a makeshift bed for my youngest son last year (before our oldest son got married). At the beach time you enjoyed wasting is not time wasted! What is your favorite part of vacation, and do you prefer the beach or the mountains? What a happy and fun looking place. A beautiful space to really enjoy being on vacation. 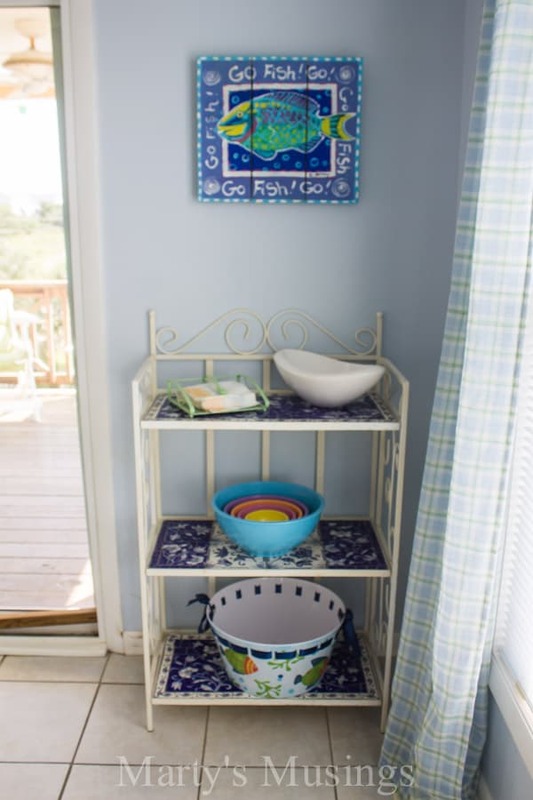 I would love to have the “Go Fish” placque….love it. We had a great time, Lizzy, and that plaque was adorable! 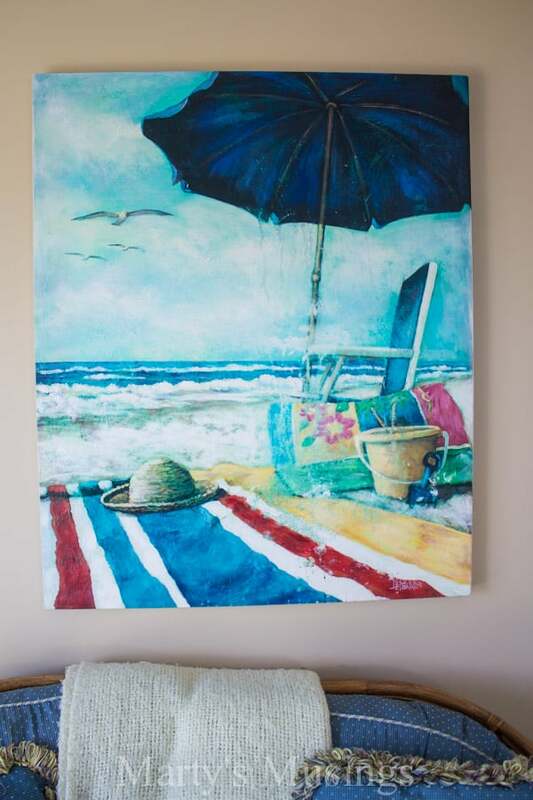 I love the print with the beach scene (striped towel, chair, umbrella, etc.). Do you know or can you tell from your pictures who the artist is? Thanks! Hi, Christy. I have no idea who the artist was but it might be somebody from NC because that’s where the rental is. That probably doesn’t help. Sorry! Hi Marty! I love both the beach and the mountains! I grew up going on family vacations to both! Now I live at the beach and I am a beach BUM! This house looks awesome! 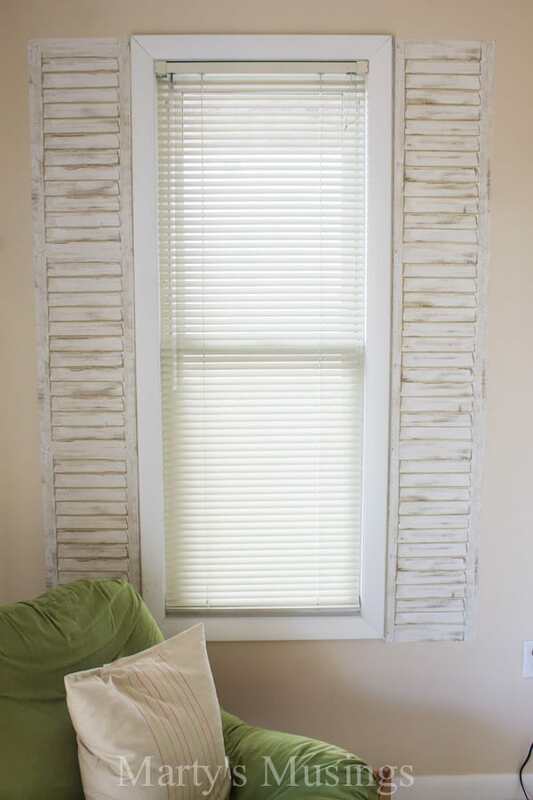 I especially love the shutters around the windows inside the house! 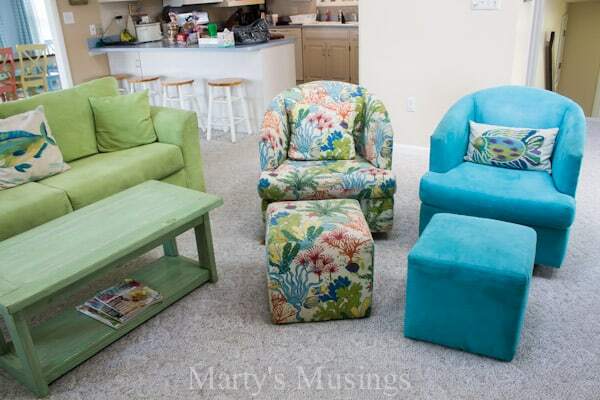 Super cute and the dinning room chairs are pretty cool colors! 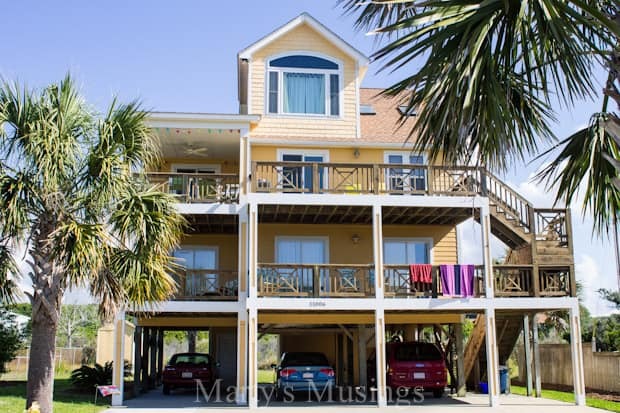 Thanks for sharing this awesome beach house with us! 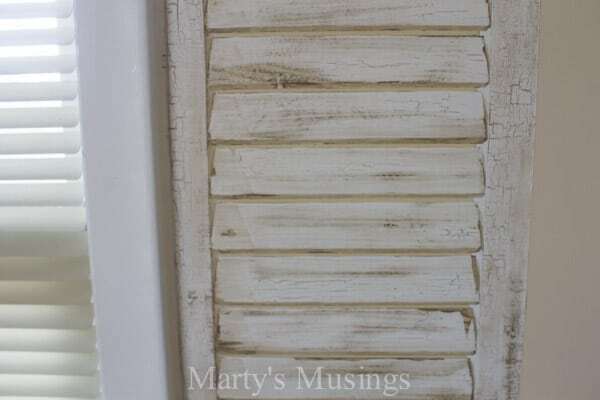 Dropping in from Snickerdoodle Sunday linky party! Hi, Gina Marie. I love the beach for a one week vacation but not to live! I am not a hot weather fan although I love the breezes and a good rocking chair at night! Have a great weekend! 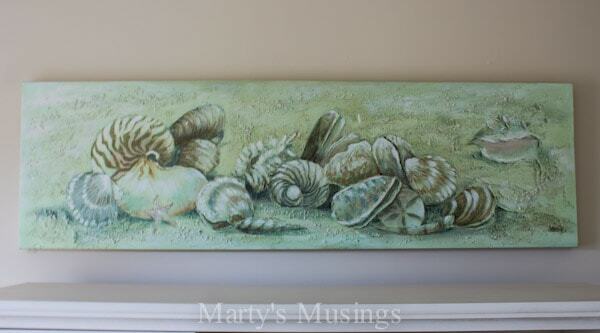 Very beachy! 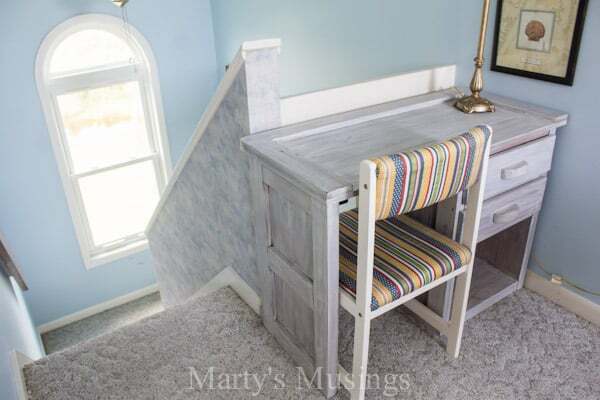 I love the mix of colored dining chairs! Visiting from Inspire Me Monday. Hi, Shelley. 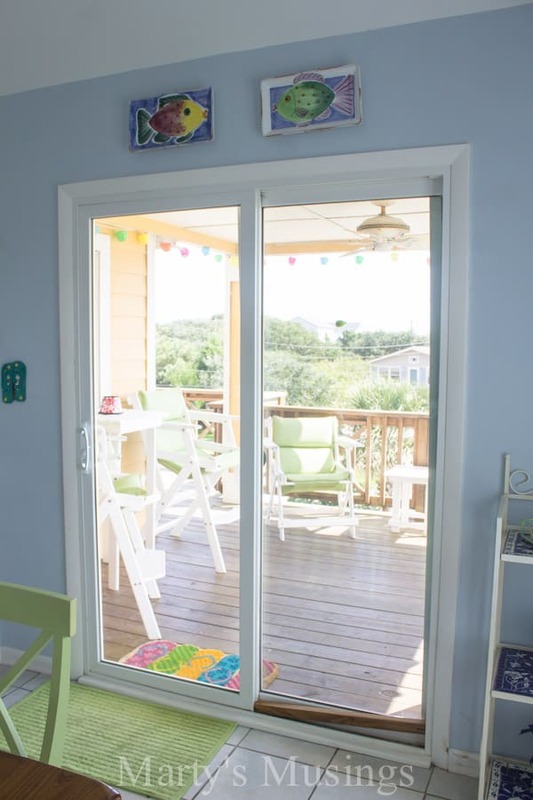 I love this beach house as well. Sure wish it was mine! Have a great weekend! What a beautiful beach house. I love that you showcased the state I live in. The wallpaper was amazing. Thanks for linking up on the #HomeMattersParty this week and I hope you will come back next week to link up again. Hi Marty1 Interested in rental info on this property??? Can you provide?? 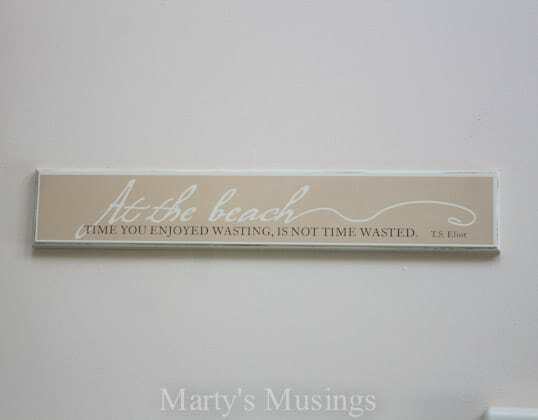 Can you tell me where (or how) to get the sign you have at the end of your blog…”At the Beach Time You Enjoyed Wasting is Not Time Wasted”? I sure would appreciate it! Hi, Linda. I wish I could help. This was actually a beach house rental our family used. Sorry! Would so love to do what your family did, think am dreaming. Love being at the beach. Have read so many family beach books Have myself convinced would be great. That’s if all the family get along. lol. Glad to hear you had wonderful time, did those days fly by? What a great house, loved the decorating. Hi, JaneEllen. We’ve had some wonderful beach vacations, but they were never picture perfect! Always a lot of planning and hard work, usually some complaining, probably mine! Not sure it was even relaxing but we always created memories!